I just realized, for all the times I've had this brew, I've never reviewed it. let's fix that. 12oz bottle poured into 12oz goblet. Poured a solid very dark brown, almost black color with just the thinnest cap of light tan head that no retention or lacing. Light bourbon upfront on the nose, with a solid malt/grain scent backing it up. And, just enough wood to be noticeable. The flavor is equally exquisite, all aspects combine nearly perfectly, with none dominating, but all having a starring role. The body is the weakest link, IMHO, I would like it a bit fuller, so that I would drink it slower. For the style, the does finish, relatively, dry. Drinkability is awesome. Just stunning. I've consumed a bunch of these, and they never let me down. Overall, a must-try, worth seeking out. This is absolutely my favorite Barleywine, so I might be a bit biased, but this is a magnificent brew. You owe it to yourself to get ahold of some. Poured into a Reuben's Brew small snifter. Pours a very dark mahogany brown, appearing nearly opaque in the glass with a fine, one finger dark khaki head with great retention and thick lacing. Aroma of dark malt, bourbon, dried plums, figs. Flavor is deep caramel malt, fresh plums, raisins, figs, a hint of lighter stone fruit. Finishes with caramel, bourbon and fresh plums. Medium bodied with nice light to moderate creaminess and smooth mouth feel. 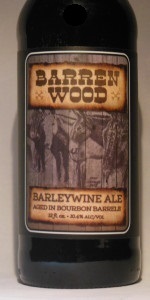 A very approachable barleywine. The profile leans heavily towards an English style, but all the fruit flavors are much fresher, as someone else noted, some similarities with a Scotch ale (but no peat or smoke). Starts well and then the lighter fruit flavors develop, making this more interesting than a traditional barleywine. Excellent creaminess in the feel. This looks, smells and tastes great. I'm tardy in reviewing this, but hope I can find a few more bottles of this. The fresher fruit flavors may not survive cellaring as well as traditional dried fruit character, but I'd like to see how this develops. Very reasonably priced too. Although this is characterized as an American strong ale (and that's not off kilter), I'd list this an English barleywine, as that is the closest profile (and it claims to be a barleywine on the label). It's a very fine sipper in any case. Pour is rich, dark chocolate brown, tan head. Beautiful. Aromas are rich toffee, some caramel, and the barrel. The malt base dominates the taste, with the toffee a most welcome leader. The barrel was very prominent on the first couple of sips, but it stepped back a bit as this warmed, which was a welcome development. This reminds me more of an imperial BA scotch ale than a barleywine - very similar to Central Waters BA Scotch Ale. T: slight toffee, caramel and raisins. Decent barrel presence just not a smooth and rich bourbon profile. F: quite thin body and a lot of carbonation. Very much in the English Style, which is to say the malts are firmly at the forefront. While I liked this, and found it to be smooth and easy-drinking for a barley-wine, with the alcohol unnoticeable, it also struck me as somewhat pedestrian. Lots of caramel and pleasant sweetness, but not a whole lot of barrel or much else. Solid, definitely, but simple.